Holiday party planning comes once a year. And you know that all good parties start with an inspired holiday menu. Your team will probably remember the food more than the entertainment, venue, or even the company gift. So it’s important to get it right. What can you do to make sure your holiday party menu is unique and satisfying? Here are few ideas to spice up your holiday party in no time. After all, there are parties for hosting and marshmallows for toasting (maybe). Choose your venue and corresponding theme first, and then plan your food around the environment. If your venue has accessible tables and chairs, you can plan for hearty plates that require a fork and knife. If your party locale is an open loft space conducive to mingling and casual conversation, then bite-sized finger foods are the way to go. When thinking of themes, just remember office parties don’t have to be a bore. Go nostalgic this year and consider out-of-the-box themes like “80s Throwback” or “Old Hollywood.” Once you’ve settled on a venue and a party theme, coordinating suitable menu options for the space becomes less daunting. A swanky theme won’t pair well with buffet-style menus just like a sit down table service doesn’t work for relaxed gatherings. Whether you’re planning an elegant plated meal, dinner buffet, or casual hors d’oeuvres, a seasonal cuisine elevates any menu. Fruits and veggies like cranberries and oranges or sweet potatoes and yams are a simple festive addition to any holiday entree or side dish. Winter side dishes like butternut squash risotto or winter fruit compotes pair well with time-tested entrees like honey glazed ham or peppercorn roast beef. Some dishes suit holiday office parties better than others. Your regular sandwich and salad bar for your office lunch meetings probably isn’t an appropriate meal for the yearly office party. If you need extra inspiration, ask your office to throw in their two cents and provide examples of foods they enjoy this time of year. You’ll be surprised at how diverse your employees’ food preferences are based on their personal heritage and holiday traditions. Local, farm fresh food is growing in popularity as people continue to crave organic, locally grown ingredients. Consider incorporating a few farm-to-table ingredients into your holiday menu to add flair. For example, a simple salad can be upgraded into a holiday apple salad farmed and sourced locally with apples, cheese crumbles, and greens. Even a traditional beef stew could be elevated using red wine from a local winery. Think creatively about ways to revamp some of your favorite dishes to include fresh, local foods that your team will love. Restaurant Business Magazine says comfort food is another trending cuisine making a comeback on American menus. Nostalgic dishes pair perfectly with the warm, comforting feelings often associated with the holiday season. Your guests will be pleasantly surprised when presented with a perfectly cooked meatloaf — a dish that’s showing up on every restaurant menu this year — a roasted root vegetable gratin, and spiked bread pudding for dessert. Every cuisine has their own version of comfort foods that will satisfy many varying dietary expectations. Simply choose a cuisine to pair with your theme. Pair the entrees with a hot cocoa or winter cocktail bar and you’ll have your guests feeling right at home throughout the entire evening. 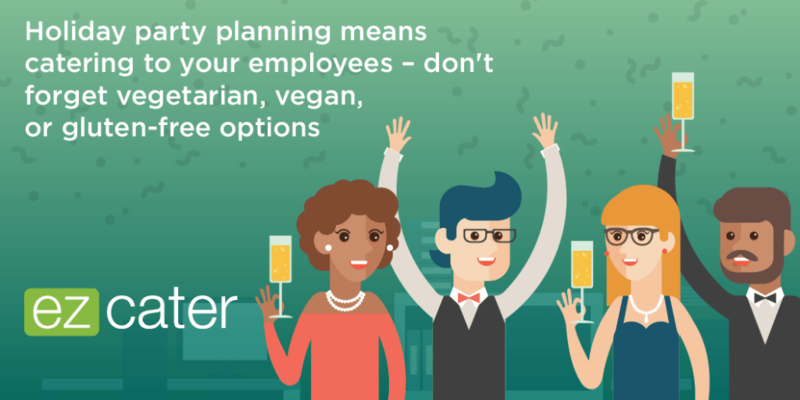 Don’t forget your vegetarian, vegan, or gluten-free employees. A big part of holiday party planning is catering to your employees — and their guests — with dietary restrictions. But making these guests feel welcomed while also satisfying a large crowd can be difficult. Then again, the holiday season is also a time when many employees may hope for lighter options to counteract all those Christmas cookies they’ve been eating. You can cater to a wide variety of dietary preferences as well as health-conscious employees by providing a couple vegetarian or vegan options along with other meat entrees. Make life even easier by choosing side dishes and appetizers that pair well with all entrees. Easily customizable items like crostini, caprese skewers, or brussel sprouts with bacon and cranberries are festive, wholesome, and suitable dishes for many diets. Of course, these numbers will vary based on your specific event. it’s best to air on the side of too much rather than too little. Luckily when you enter your attendance numbers into ezCater, it does the math for you, and you can worry about the rest of the details. Inspired to order your holiday party catering? 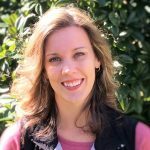 Lauren Hamer is a North Carolina based writer and entrepreneurial career consultant. She has crafted office management, workplace trends, and lifestyle content for clients including The Muse, Glassdoor, Yahoo!, Office Ninjas, and more. When she’s not writing about work or food at work, look for her in the kitchen making up recipes and flipping fry pans like she’s on an episode of “Chopped”.